Wheat & Weeds: Merry 6th Day of Christmas! Merry 6th Day of Christmas! Each year the Nativity scene and Christmas tree speak to us through their symbolic language. They render more visible what is understood from the experience of the birth of the Son of God. They are the signs of the heavenly Father’s compassion, of his interest in and closeness to humanity, which does not feel abandoned in the darkest of times, but sought out and accompanied in its difficulties. The tree reaching upward spurs us to reach for “the higher gifts” (cf. 1 Cor 12:31), to rise up above the cloudy haze in order to experience how beautiful and joyful it is to be immersed in the light of Christ. 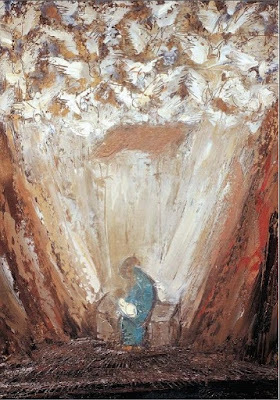 In the simplicity of the Nativity we encounter and contemplate God’s tenderness, manifested in that of the Baby Jesus.